I stayed two weeks on Bonaire in July/August 2009. Bonaire is one of the six Caribbean islands belonging to the Kingdom of the Netherlands. It has a size of some 300 square kilometers and a population of some 14,000. 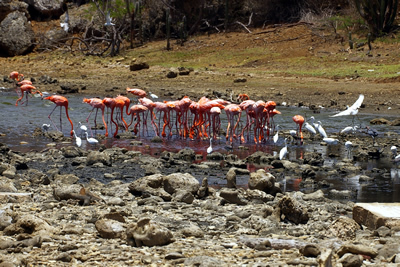 Bonaire has a tropical climate with temperatures around 30 degrees Centigrade on most days. Precipitation is low and hence the landscape is somewhat desert-like. The landscape gets quite green after showers. The island is advertized as "Diver's Paradise"! The underwater world is very spectacular, with corals, fishes and turtles. Above the ground we find some historic buildings, limestone formations, and the beautiful Washington Slagbaaipark in the northwest. Nature lovers can see many species of birds, trees, cactuses and other vegetation. The southern part of the island is quite flat with many salt lakes. The main economic activities are agriculture, fishing, salt winning and - very important - tourism. The island has an international airport and accommodations in many price classes. The official tourist website is http://www.tourismbonaire.com/ .